Botswana : When and where to go? Located in the Tropic of Capricorn, the country has a relatively mild climate. Summer, which runs from November to March, corresponds to the rainy season, and the humidity and heat are very high, the floods can make the roads impassable. The dry season runs from April to October, with temperatures around 25 ° C during the day, which can drop to 0 ° C during the night in July. Sandstorms from the west often blow in August. During this winter period, the days are sunny and sweeter, and it is the most favorable time for a pleasant visit of the country. Also, the recommended periods for a trip to the country are those that avoid both high temperatures and heavy rainfall. In the year, they are spread from April to September, that is to say from the end of the spring season to the beginning of autumn. Mainly geared to high end tourism, Botswana generally attracts wealthier clients. 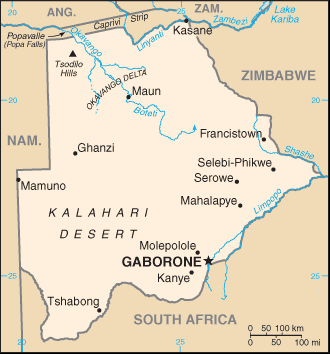 Gaborone, the Capital, offers various museums, nightclubs and numerous sporting activities that are generally expensive. From here you can also visit the Mokolodi Nature Reserve which is home to various species of African wildlife. The north east area equally covers the National Parks and Reserves such as the Chobe National Park (one of the most popular), the Makga Dikgadi and Nxai National Park, with grandiose landscapes which is also the home of the biggest tree in Africa, the Chapman Baobab with a 25m diameter. It is difficult to not continue up to the Okavango delta which spreads over a large area inhabited by extraordinary wildlife in a fabulous setting. The Kalahari Desert in its turn offers an unparalleled sight: Its multitude of animals including the brown hyena, its diamond deposits at Jwaneng, and the rare animal species such as the red hartebeest and the blue wildebeest at Mabuasehube-Gemsbok National Park are just a few reasons for visiting this extraordinary place. As you have no doubt gathered, nature is the principal commodity of Botswana which is jealously preserved and therefore has great tourist appeal. Air companies serve Botswana through Zimbabwe, Namibia and South Africa. A visa is not necessary; a current valid passport will suffice. The currency in circulation is the pula. The budget required for Botswana is fairly high; the prices are around the same as those in Europe unlike many other African countries. However the services and quality, from accommodation to the food, are also to an equally high standard. The main health precautions to be taken concern the risk of malaria (protect yourself against the mosquitoes) and the high incidence of AIDS here. Take care when you visit nature reserves or stay in wildlife areas. Travelling within the country is best undertaken by car.